Gardening experience- This is my second year of real gardening (my first year was a 16 x 16 plot in a community garden). To mulch or not to much? I didn’t know it then (but I do now) that most hay carries with it weed seeds. Which might explain why, despite my best efforts to mulch thoroughly, them weeds just kept coming back again and again and again. So don’t use hay, if you’re planning to mulch! Because I kept dealing with weeds, the mulch actually made my job far more difficult. I couldn’t properly get to the weeds through the mulch, so they had a bit of a heyday at times. I would often just rip off their tops in frustration, knowing that I couldn’t get to their roots. This winter, I’m covering my grass with fallen leaves, which won’t have any weed seeds (right? Please tell me I’m right!). I wanted to plant buckwheat for over the winter, but I didn’t do it soon enough. My hope is that the leaves will keep it a bit warmer, and start to compost a bit so that they add more organic matter when I turn them under in the spring. They should also be easy to turn under by hand, which is important, because I now have raised beds that would be really difficult to use a tiller on. I did use one this year, as my garden was just a big empty space that hadn’t been tended to much in the last couple of years. It was weedy and tough, to say the least. I rented a tiller from Home Depot (in the springtime, at least where I live, they rent them for half price for 1/2 day rentals on Tues-Thurs). I still had to go through by hand first, to get out as many big weeds as I could, and then again after to get everything else. It was still tons of work, but I do think the tiller made my work easier. It probably also spread the weeds more, which I paid for this summer, but quite frankly, I’m not sure I would have managed to get it all done and ready to plant this year without the tiller, so I’m considering it worthwhile (but only this one time- no more tiller for my garden!). Loved: Black Beauty Zucchini, Marvel Striped Tomatoes, Vegetable Spaghetti Squash, New England Sugar Pie Pumpkin, Lemon Cucumber (grows quickly- great for Northern growers, and sooo tasty! ), Boston Pickling Cucumber, Red Cherry Tomato Peacevine (so prolific! ), Oregon Sugar Pod II, Nantes Scarlet Carrot Seeds. Liked: Purple Top White Globe Turnip, Burt’s Blood Beet Seeds, Chantenay Carrots, Mizuna Oriental Greens, Aunt Ruby’s German Green Tomato, Jimmy Nardellos’s Sweet Italian Frying Pepper (didn’t get too eat in the end, but it looked really promising), Butternut Waltham (mine didn’t do really well, though the one I got is very nice), Japanese Long Cucumber, French Summer Thyme, Oregano Vulgar, Dill Bouquet, French Breakfast Radish Seeds, Alaska Shelling Pea, Costuloto Fiorentino Tomato (big harvest, but texture was a bit mushy for me), Olga Romaine Lettuce. There were a few other variety of things that I can’t really comment on, such as another pepper variety (Antojii Romanian), watermelon (Sugar Baby), onions (Stuttgarter), spinach (Monstrueux De Viroflay), broccoli (De Cicco Italian) etc. because they didn’t do well enough for me to have a valid opinion (through no fault of their own, but because of my summer weather, or bad planting, etc.). Most of my seeds came from Baker Creek Heirloom Seeds (they are fantastic, I will definitely buy from them again next year!). The rest came from either Heirlooms Evermore, Full Circle Seeds, or a teensy local company I purchased from at a garden show. One thing that I will definitely do next year is plant more flowers! This year, I had 3 large sunflowers, and two patches of nasturtiums, and a couple small pots with wildflowers that never really took off. Next year, I will be filling pots with nasturtiums and marigolds and putting them all around the perimeter of my garden, and will try again to make the wildflowers much more successful. The bee shortage was really evident to me, and so I think it’s really necessary to plant many more flowers and not just to try to keep away garden pests (though that’s another great reason to do so). I had many instances where lack of pollination kept my crops from doing well (specifically my cucumber and squash). I should have tried (but didn’t) to hand pollinate, and will do so next year if it’s more of the same. I kept a lot of my spring veggies together, leaving nice open and sunny spaces to fill with my summer-loving plants. This also gave me an easy place to replant for the fall, as I just went back to where the spring plants were, and rearranged things a bit while the sprawling summer plants (ie. squash, pumpkin, tomatoes) stayed put well into the fall. I did some peas and cucumbers along my back fence, which made for easy trellising and access, plus they didn’t block the sun from other plants. My squash were at the end of my garden, back by the fence. This was good, because I planted too many and they ran into the grass and along the back garden path. If they had been more in the middle, it would have really gotten in the way of things. I planted squash seedlings near some squares of onions and carrots in the early summer, not realizing how fast the squash would take over. It seriously hampered the growth of the onions and carrots, and made them very hard to harvest. To get to my cucumber vines, I had to walk through (over, under, on top of, trying not to trip over, etc.) my overgrown squash, and I know I stepped on the squash vines at least a couple of times (besides, it was just a pain trying to get past it). I planted all of my curcubits (squash, zucchini, cucumber) clumped together, and when one got powdery mildew, they all got it. I fought it like crazy for half the summer. Ugh. Parsley grows insanely- don’t do as I did and plant sun-loving thyme next to it. My poor little stunted thyme plant. I’m considering taking the parsley out of the garden and potting it instead. I started my first seedlings around mid-March (tomatoes, peppers, and a couple others), but many I didn’t start until April 23 (watermelon, squash, herbs). The early ones did well, but I still don’t think they were big enough to really do well in our cooler summers. I wish I had started the tomatoes and peppers a few weeks earlier, to have them hardier by planting time. When I planted them, the tomatoes were about 6 inches tall (maybe some were 8 inches? ), and the peppers were about 4-5 inches (they were the slower growing of the two). Next time, I would definitely give them some protection (as in, a cloche of some sort) when putting them out, to get them off to a faster start in the garden. My other seedlings did fine, despite the late start, except my herbs were hard to germinate. They didn’t do that great, and I had a smaller herb garden than I had hoped for. For all my seedlings, I pre-soaked the seeds them first, for at least 6 hours, before planting. I think this really helped (most of them) to germinate well and quickly. Except for those darned herbs. Hmm… Do make sure to learn from my seedling mistake, though. I also don’t think that you can be careful enough with your hardening off process, specifically when you live somewhere with less favorable (and more touchy) weather, as I do. In the midst of hardening off my tomatoes and peppers, we got hit with weeks of cool and rain, after a somewhat sunny spring. Looking back, I might have pulled them back inside for another week or two, or planted with really good garden protection (like a cloche or plastic covering). Oh yes, and believe the books when they say to plant broccoli from seedlings, not straight into the ground! I assume the same would be true of cauliflower. 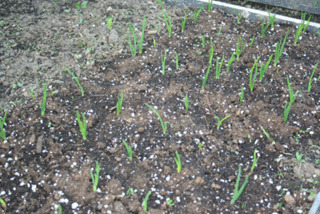 Spring- I had my cooler weather crops in by April 27, which I think could have been earlier (I’m talking lettuce and greens, onions, peas, turnips, carrots, etc.). Next year I will probably start planting by late March or early April, to get more of a jump on the growing season. Those plants could have handled it, as our last frost date is around April 10 and most of those veggies are frost hardy. I got my warmer weather crops in around late May, I believe (I can’t find a specific date anywhere in my notes). Early June was quite cold and rainy, and I lost quite a few seedlings (watermelon, one pepper and also some cucumber that were planted straight from seed), plus my other plants (tomato and pepper) were a bit stunted and took a while to recover. If I decide to plant them that early again, I will definitely rig up some protection. Otherwise, I will keep my little seedlings inside for longer, even if it means transplanting them into large containers before planting them. Fall- Oh, I planted wayyy too late for a good fall harvest! I had intended to get a bunch of things out by mid-August, but it ended up being more like late August, early September. My spinach didn’t arrive in the mail before our trip to Arizona, so it wasn’t in the ground until late September, along with my radishes. Only the stuff that was in by early September made it at all, and even so it hasn’t done too well (my lettuce isn’t very big, and neither are my beets, my turnips are only so-so and one of my pea varieties is looking like it won’t produce). I definitely learned that for my plants to be harvestable by Oct/Nov, they need to be put in when it’s still quite hot out in August or they just won’t have sufficient sun and heat to get big enough before the Fall weather really slows them down. So, if you’re going to compost, don’t be a lazy composter and forget to turn your pile. Or you might end up with a layer of mold on top. Ask me how I know. I think I’ll have to take off the mold layer and ditch it, then try to turn everything really well before winter fulls sets in, to have a hope of some decent compost for my spring garden. Rows? Square foot style? Or seeds scattered randomly? 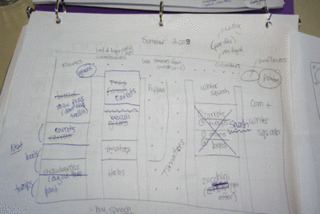 grid style of planting seeds and seedlings (check the website too). Rather than using your typical row, it uses a square with a grid system. So in your turnip square, you will plant 9 turnips seeds, evenly spaced out over the square, rather than one long row of turnips. My personal experience is that the veggies have more room to grow this way, they grow bigger, and it makes better use of the space than using rows, especially for those with smaller, backyard gardens. 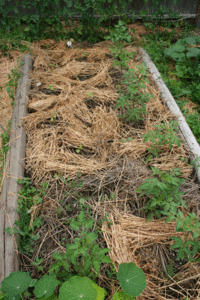 I also find that I waste less seeds than when doing rows, and don’t have to do any, or very little, thinning of plants. I don’t make a real grid, like he recommends. I just eyeball it and try to plant my seeds in approximately the right place and it works great for me. My main issue this summer was powdery mildew. The best I was able to do with it was to cut off the affected leaves as quickly as possible, and then spray it with one of two things. The most effective way to prevent it’s further spread was to use a mixture of 1 part milk to 9 parts water, and spray the leaves and stems well, every couple of days. I tried a baking soda mixture to, but found the milk more effective. The birds just loved my corn and snapped it up before it had a chance to germinate and take root. Next year I’m going to try putting some sort of netting over the garden until the seedlings get going a bit, to keep those little birdies out! My broccoli became a skeleton of a plant, from the caterpillars and slugs. I didn’t work very hard to save it, because it seemed pointless. Next year, I’ll try cutworm collars, and maybe even some netting or covering as well. I’ve also read that a garlic or hot pepper spray can help (not on the plants, but around them), so I’ll give that a shot. I’ve also heard that a border of coffee grounds can help deter the slugs (and I’ve never had success using crushed eggshells for that purpose- though I know that some swear by it). So nice to read someone else’s gardening journey. My dh just built me 3 small boxes (we don’t have much space or good soil). I am using my bil’s manure (he’s a dairy farmer) but am questioning that since they are not organically fed cows. I have heard that broccolli s more difficult to grow, but we eat so much of it that I just have to try it. I’ll be sure to keep my eyes open for slugs – ugh! Thanks for the seed links – I’ll be using those! b.t.w. If you read Wise Traditions, the latest issue has a great recipe for ‘Fish Burgers’ that my kids just loved! If you don’t have the latest volume, email me and I’ll send you the recipe – you’ll love it and you can make the patties to freeze for later. Great post – tons of great information. And – WOW – that was a lot for your first year! You sound like a seasoned gardener! I was amazed at the amount of weeds I faced and now I know why – hay! Thanks for passing that lesson along. I have never heard of square foot gardening, but I am going to try it! I am also going to check out the links for seeds. Stephanie, I really like your raised beds. My family had them growing up and I’m looking forward to having some of my own. Thanks for hosting this carnival! I’m excited about reading all the great info that everyone will post. You really took on quite a bit for you first year gardening! I had the same issues with my peppers and tomatoes. I got alot of tomatoes, but only 3 peppers. 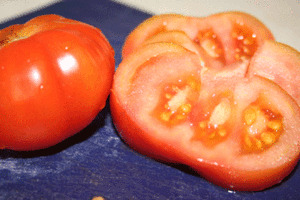 The rain we had in august wasn’t very good for the tomatoes though, did you get blight? I’m sorry I didn’t get back to you, Stephanie…life took over and I wanted to get to this but I didn’t. Then I have tried 3 times to get this to post and I keep losing my internet connection. So I hope this works now. I dug a new garden in very clay soil. We had to add some dirt to make it work. My zone is 2b to 3a. Its hard to grow here as we can get frost as late as late June and then early September. This year it was June 9th and September 15th, I think. Due to this, I am going to try growing some things in cold frames next year, I hope. The cooler (spring and fall) crops do really well here and grow all summer. I had lettuce from June to October! My other issue is the earwigs. We have a ton of them in my area. Not just me but other gardeners. The best method I found was using a shallow container like a tin plate, plastic container, fish can etc. and putting it into the ground 1/2 full of water, like a little inground swimming pool. Then fill it with a few drops of dish soap, about 2 tablespoons of veggie oil or olive oil, and if you can, a drop of fish oil or soy sauce. The earwigs are attracted to the smell and drown at night. You have to empty it every day. Also don’t have things lying around for the earwigs to get into and hide. They come out at night. This method was much cheaper and much more effective than commercial natural earwig traps. I used a variation of the square foot method. I did 3 beds- one 26×4 and two 12×4. I as always tempted to step across the big one though so I would say don’t go more than 16 feet length or make a break. Have at least 4-5 feet between beds- things grow! I loosely used the square foot method of spacing things but do keep in mind what plants will grow tall and shade out other things or flop over and shade out other things, like tomatoes or beans. I planted my vines too close together and got cross polination. Next year I hope to try a trellis like in the new square foot gardening book that can support big heavy crops and then put each vine variety as far apart as possible. Succession planting worked well for me to a point. I can’t plant any new things later than mid August here to mature around mid September. Like radishes and spinach. I tried later and just wasted seed. I had fresh radishes June through August though with succession planting. I did try to put in some totally new crops as well after things were done but there simply isn’t enough time in my area. I learned about harvesting that pumpkins turn orange after they are brought inside, and beans freeze best when they are still on the smaller and thinner side rather than starting to get fat with seeds. Herbs weren’t worth it for me as its not hot enough to grow them big, and then I dehydrated them and got so very little for the amount of work I put into them. Next year I plan to focus on the things that do really well here. I want to plant more potatoes as they did really well too. I hope this gives you an idea of what I learned. I’m enjoying reading all the gardening experiences! What a good idea. 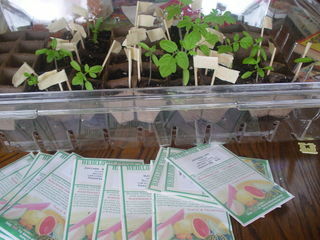 Just wanted to pass along that The Seed Saver’s Exchange (www.seedsavers.org) is another great place to get heirloom seeds. They will even send you a FREE catalog that is absolutely gorgeous. I haven’t had a lot of luck with heirloom tomatoes and peppers, but I’m going to keep trying! I just mulched with hay 2 months ago at the advise of my seasoned gardener friend. She instructed me to lay cardboard on top to encourage the worms to compost. I never heard her mentioned the weed seeds. I did want to add my experience with putting leaves in my garden last year…..our soil became acidic and hardly anything grew in it. In the fall, we did throw leaves in the garden but added limestone. She also had great success with rock dust. Hope that helps! When you planted your lettuce and greens, did you plant the seeds in your garden, or did you sprout them first? GiBee, I also do my lettuce and greens straight from seeds, and I don’t pre-sprout them. I do like to soak my seeds overnight, though. This makes them harder to plant, but I find they germinate easier and more reliably. I have also planted them without soaking and this worked fine as well, but it just took a few more days for the seedlings to come up. I really like this article! Thank you for posting!